Historians of the Civil War have rightly pointed out the many factors that divided the two sections of the country and eventually led to the final crisis of the Union. There were contrasting theories of federal power and states’ rights; tensions between competitive economic systems; a breakdown in the prevailing political party structure. But perhaps nowhere were the differences between the Northern states and the Southern states so striking as in their cultural views regarding the future direction of the nation. The goal of Boston’s social and intellectual leaders from the 1820s well into the 1840s had been to transform their city into a kind of Athens in America, a creative and rational model for the rest of the nation to embrace. But not all Americans were pleased. The irony was to be that in pursuing their city’s (and their own) moral and intellectual improvement, Boston’s leadership elite would contribute to a deepening cultural divide in the country, making inevitable the final squaring off over the explosive issue of slavery. Mouse over a portrait for biographical information. Such meetings were not the exclusive domain of Boston men. Many women of the city also enjoyed opportunities to exchange views on matters of shared intellectual interest. A leader in arranging such opportunity was Margaret Fuller, whose father, a lawyer and congressman, had provided her with a vigorous program of academic studies that set her educationally well above most women her age. As a teacher for a brief period at Bronson Alcott’s Temple School in Boston, Fuller made lifelong friendships with Ralph Waldo Emerson and other prominent intellectuals. Her talents as a critic and a poet were recognized by the men and women of the Transcendental Club, which made her editor of its journal the Dial in 1840. At the invitation of Horace Greeley, she became a literary critic for the New York Tribune, and in 1845 published her book Woman in the Nineteenth Century, calling for the opening of every occupation and profession to women. In 1839, Fuller started a series of “Conversations” with a group of women from cultivated Boston society. They met on Wednesday evenings at the home of Elizabeth Peabody. The daughter of a dentist and a teacher who developed her interests in languages, literature, theology, and philosophy, Peabody opened a bookstore on West Street, which quickly became a headquarters for local transcendentalists. She published books and pamphlets produced by her transcendental friends, and for a brief period also published the Dial, establishing herself as the first female publisher in Boston. In addition to a remarkable diversity, Boston’s leadership elite could claim a second distinction: Unlike many of their European counterparts, they had little interest in remaining apart from the general population as a separate caste. They were not satisfied with merely raising their own intellectual standards, or those of their own circle of well-placed, highly educated friends and colleagues. They wanted everybody in America to know what they had to say about philosophy and religion, about the arts and the sciences, about how life and society should be in a changing America. Bursting with new ideas, confident that they had found the way to a more happy, prosperous, and progressive future, Boston’s intellectual leaders looked for whatever outlets would let them make their views known to as wide an audience as possible. Newspapers, magazines, and literary journals offered the most immediate opportunities for circulating their ideas. Back in 1803, a small group of prominent Bostonians devoted to literary interests had formed a club they named the Anthology Society. They were not professional men of letters—Joseph Stevens Buckminster and William Ellery Channing were preachers; William Emerson was founder of the Philosophical Society; William Tudor (credited with the first reference to Boston as the “Athens of America”) was a merchant and entrepreneur in the ice trade; John T. Kirkland was president of Harvard College. They enjoyed meeting once a week over dinner and, with Channing as the editor in chief and young Richard Henry Dana as his assistant, they inaugurated what would become the magazine called the North American Review, whose articles, essays, and poetry were a testament to the range of thinking in Boston’s literary and academic circles during the 1830s and 1840s. In 1857, a number of the local literati decided to found an even more ambitious journal that would demonstrate the best thoughts and ideas of American writers. The first issue of the Atlantic Monthly (named by Oliver Wendell Holmes) featured contributions from the historian John Lothrop Motley, poets Henry Wadsworth Longfellow and John Greenleaf Whittier, Ralph Waldo Emerson, Harriet Beecher Stowe, and Holmes, whose popular “Breakfast-Table” essays would run in the journal’s pages. The printed page alone, however, was not enough to satisfy the vigorous energies and exploding ambitions of Boston writers and thinkers. In the late 1820s, Josiah Holbrook of Connecticut, a Yale graduate and an itinerant lecturer on scientific topics, began organizing community groups in Massachusetts into a system of town lyceums to promote what he called “mutual education.” The idea of lecture programs quickly caught on, and by 1839 the American Institute of Instruction and the American Lyceum Association had established almost a thousand local societies in New England to satisfy the thirst of the general public for information on literature, the arts, the sciences, and the new social and educational movements that were springing up. In Boston, local clubs and institutions established programs of public lectures throughout the city. Among the best known were those of the Useful Knowledge Society, the Boston Lyceum, the Natural History Society, the Mercantile Library Association, and the Mechanics’ Apprentices’ Association. Free lectures sponsored by the Lowell Institute drew as many as 10,000 ticket seekers for talks by some of the most prominent scholars in the country: Jacob Bigelow, a Harvard botanist, spoke on “The Elements of Technology,” a word he did much to popularize; Harvard Divinity’s Henry Ware gave a course on Palestine; Edward Everett spoke on Greek antiquities; James Russell Lowell discussed poetry; Ralph Waldo Emerson gave a series of biographical lectures; and John Farrar, a Harvard mathematician, discussed implications of the steam engine. In his reminiscences of A New England Boyhood, Edward Everett Hale recalled attending such lectures as a young man. He would meet his friends at the hall, they’d listen to the speaker, then end up at somebody’s house afterward for oysters, crackers, and cheese. As early as 1647, the General Court of Massachusetts had ordered all townships with more than a hundred families to establish grammar schools. Puritanism, after all, required both an educated clergy and a literate congregation to read and interpret the Scriptures. And as a growing commercial center, Boston needed men who could understand ledgers and calculate inventories. After the Revolution, a comprehensive state law in 1789 cemented what had become the general practice, requiring townships to establish primary and grammar schools open to all children and administered by a popularly elected school committee. By 1860 the principle of free, tax-supported, public education—at least at the elementary level—was accepted throughout most Northern states. Apart from producing literate citizens and industrious workers, Boston’s new public schools were regarded as an essential part of the social-reform spirit of the period that sought to elevate minds, inspire inquiry, and achieve new levels of accomplishment. Teaching children to be more humane and compassionate Christians, Boston’s leadership believed, would prepare them for an ever more modern and complex age. To their dismay, the Boston reformers would find that elsewhere in the country, many citizens did not want to mold their lives and culture to the society they saw in New England. One person who had the opportunity to witness at firsthand this cultural dichotomy was 30-year-old Frederick Law Olmsted. Long before Olmsted designed the Boston public park system known as the Emerald Necklace, he had been a civil engineer, a gentleman farmer, and a casual writer. In 1852, he was asked by Henry Raymond, editor of the New York Daily Times, to visit the South and send back his observations. In December, Olmsted set out on a 14-month tour of the slave states, filing accounts that were first printed in the Times and later published in book form as The Cotton Kingdom. In several parts of the South, especially in the Baptist regions, Olmsted found some sympathy for Northern temperance activities. But most other reform movements of the period garnered little interest or support. Prison reformers, with their penology and plans for the reformation of felons, went unappreciated among people who believed in simple justice and the lesson of a hangman’s noose. Stories about Northern utopian communities, eccentric styles of social living, and pietistic religious reform generated no enthusiasm. Southerners by and large preferred the changelessness of their community, the homogeneity of their people, and an evangelical Protestantism tied to the infallibility of the Bible. More radical Northern reform movements—for universal peace, women’s rights, and, of course, the abolition of slavery—were regarded as outrageous and dangerous. Southerners ridiculed the idea of “long-haired men” being bossed around by “short-haired women” (see Henry James’s The Bostonians) for purposes that seemed to violate the laws of nature and reject the word of God. The lyceum movement, so prevalent in the North, did not flourish in the South, where citizens preferred the hardy and romantic novels of Sir Walter Scott to the transcendentalism of Northern writers like Ralph Waldo Emerson. Educational reforms deriving from government authority and appropriations seemed both prodigal and unnecessary. In the South, education was regarded as a private option. Wealthy Southern families could always pay for private schools or hire tutors for their younger children if they chose, and then send their older sons off to college in England or Scotland, or to Harvard, Dartmouth, or Princeton. And in the South’s rural communities, there was little everyday need for more than the three R’s; people’s future lay in tilling the soil. Nor was there any inclination on the part of most leading Southerners to develop in their region the type of industry that was powering the economy of the North. Ugly factory buildings, dirty smokestacks, noisy steam engines, and hordes of urban laborers contrasted sharply with the Southerners’ idyllic dreams of agrarian virtue growing out of the old Republic, with open green fields, sparkling streams, and pure air. Olmsted reported that many people he talked with in Virginia believed that slavery was justified because it protected the South from the class conflicts they observed in the North—rent riots, factory strikes, immigrant unrest—and from “diseased” philanthropy, radical democracy, and socialist ideas. The South, he wrote, saw crowded Northern cities as the natural habitat of agitators and wild-eyed reformers, and “uniformly rejected the isms which infest Europe and the Eastern and Western States of this country.” Two separate and distinct societies—two different cultures—made up the Union. The Boston view of a rational and progressive Christianity, with a commitment to science and technology, a highly educated citizenry, a creative literary culture, advanced social and medical services, and an expanding view of human rights and social freedom, was not acceptable to Southerners. Citizens of the South tended to regard those ideas, variously, as a rejection of fundamental Christian morality, a violation of states’ rights, and an intrusion on personal liberties; in their minds, they represented a reckless disregard for the stability and security guaranteed by long-established social systems, class structures, and racial barriers. There was not much point to further discussion. 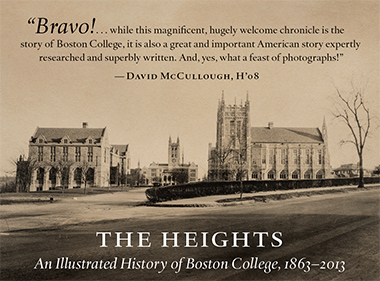 Thomas H. O’Connor ’49, MA’50, H’93, is a professor emeritus of history and BC’s University Historian. His article is drawn from The Athens of America: Boston 1825–1845, copyright © 2006 by Thomas H. O’Connor, by permission of the University of Massachusetts Press. Copies of the book may be ordered at a discount from the BC Bookstore.